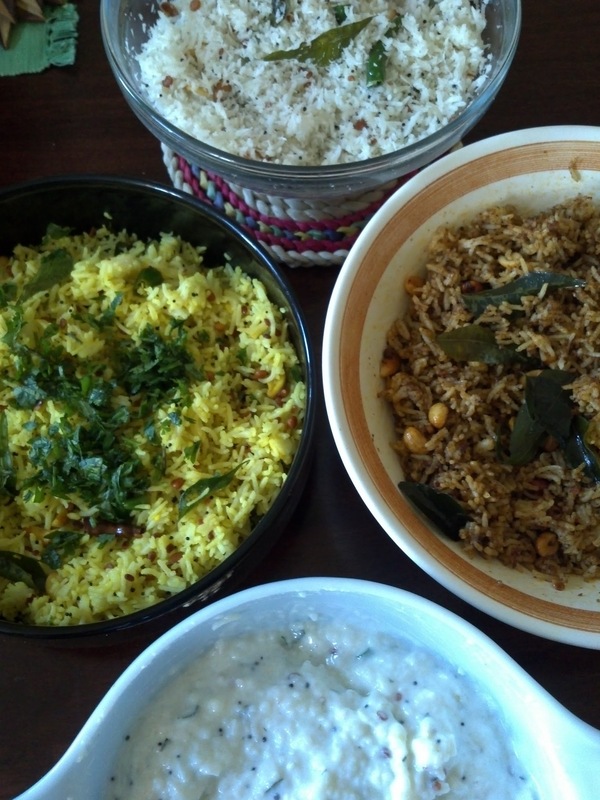 Pongal (harvest festival) was just a few weeks ago. Many people celebrate it as three or four separate days. Each day has different purposes/meanings, different traditions/rituals and, most importantly, different menus! I guess I’ll get most of the recipes online eventually, but for today I’ll focus on mixed rice recipes made on the third/fourth days. The basic ingredients in these four recipes are quite similar, but a few different ingredients in each recipe make it eminently distinguishable from the others. The ingredients should all be available at your local Indian or other Asian grocery store. These can be served with any combination of veggies, salads, chutneys, pickles and papad/chips. 1. Put the cooked rice in a large, shallow bowl that is easy for mixing. 2. In a small frying pan or saucepan, heat the oil until hot. Add the mustard seeds. When the seeds start popping, add the urad dhal, channa dhal, dried red chillies and hing. As the dhals start to brown, add the cashews and saute until the cashews begin to get a golden color. Add the green chillies, curry leaves and shredded coconut and saute for just a minute or two. 3. Remove the pan from the heat and pour the coconut mixture over the rice. 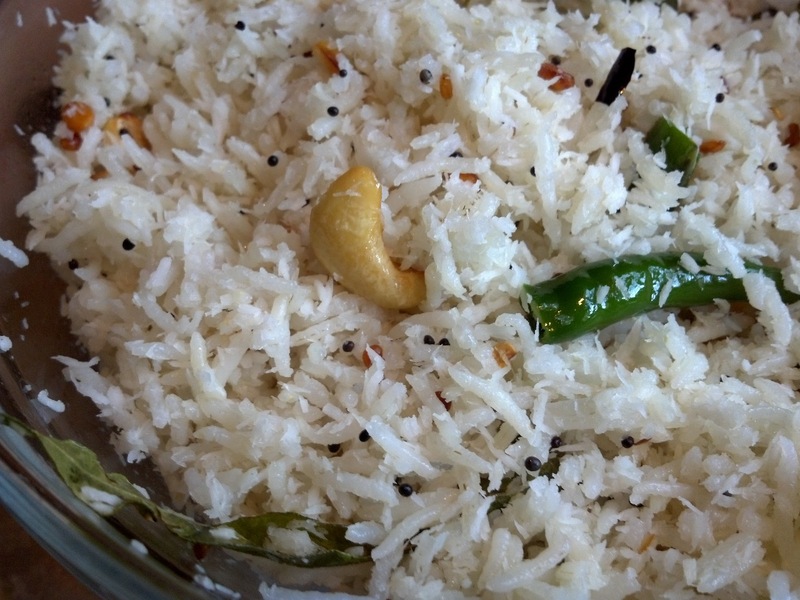 Using a large, flat spoon or spatula, gently toss the rice and coconut mixture until it has combined. Salt to taste. Can be served warm or at room temperature. Can be kept refrigerated in a tightly-lidded container for several days. 1. Put the cooked rice in a large, shallow bowl and set aside. 2. In a small frying pan or saucepan, heat the oil until hot. Add the mustard seeds. When the seeds start popping, add the urad dhal and channa dhal. As the dhals start to brown, add the peanuts and saute until the peanuts begin to get a golden color. Add the green chillies and curry leaves and saute for a few seconds. Add the turmeric powder and lemon juice, saute for a few seconds, and turn off the heat. 3. Pour the lemon mixture over the rice. Using a large, flat spoon or spatula, gently toss the rice and lemon mixture until it has combined. Salt to taste. Garnish with chopped cilantro. Can be served warm or at room temperature. Can be kept refrigerated in a tightly-lidded container for several days. 1. In a small frying pan, dry roast 1 tbsp urad dhal, 1 tbsp channa dhal, 1/4 tsp methi seeds, 1 tsp coriander seeds, 3 dried red chillies and hing. Grind to a fine powder using a coffee or spice grinder. Set aside. 2. In the same frying pan, heat the oil. Add the mustard seeds. When mustard seeds begin to pop, add 1 tbsp urad dhal, 1 tbsp channa dhal and 3 dried red chillies. Saute for a few minutes and then add the peanuts. When the peanuts become golden brown, add the turmeric powder, tamarind paste, 1/2 tsp of salt and 1/2 cup water. Bring to a simmer and cook until the mixture becomes a little thick. Add the spice powder from the previous step and the curry leaves and mix well. Remove from heat. 3. Put the cooked rice in a large, shallow bowl. Pour the tamarind spice mixture over the rice. 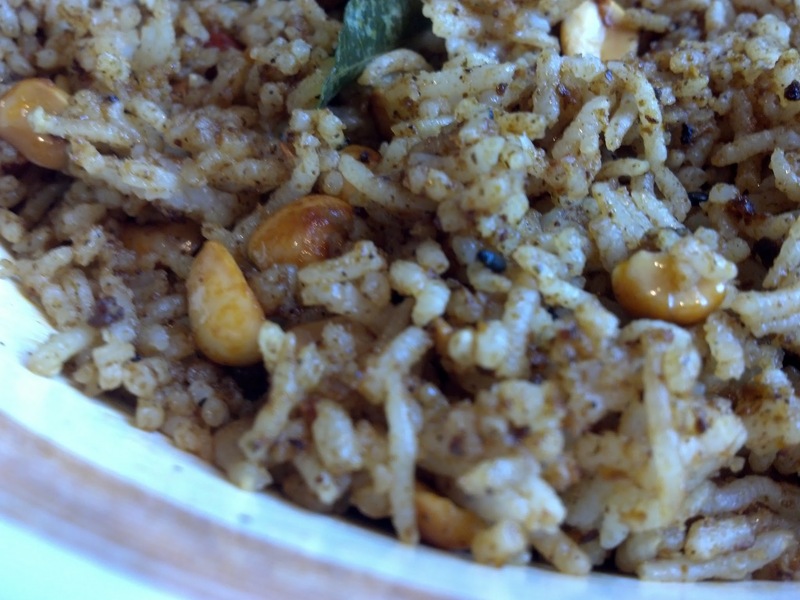 Use a large, flat spoon or spatula to gently mix the tamarind spice mixture and rice. Serve warm or at room temperature. Can be stored in the fridge in a tightly-lidded container for a few days. 1. Put the cooked and cooled rice in a large, shallow bowl. Add the ginger and 1/2 tsp of salt. Using your hand, mix the rice, ginger and salt. Squeeze as you mix in order to break down the rice grains. 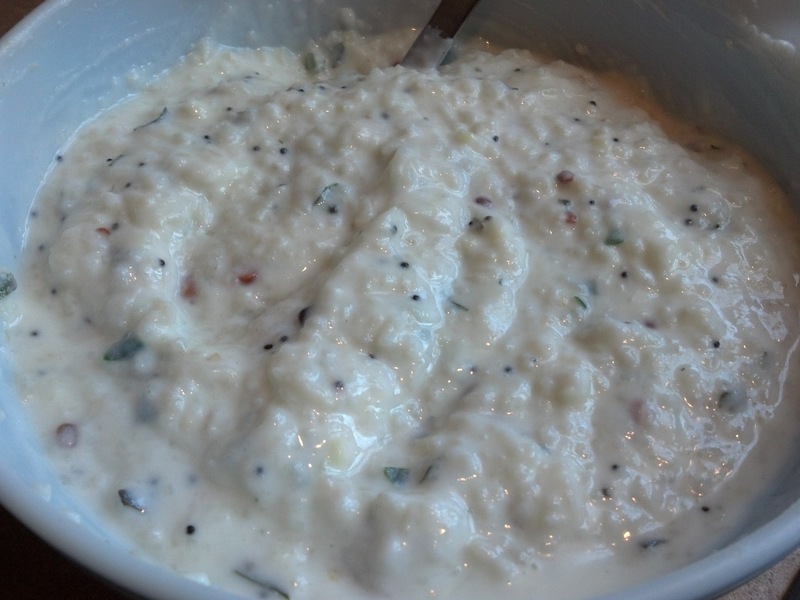 Slowly add buttermilk or yogurt, mixing with your hand as you go. 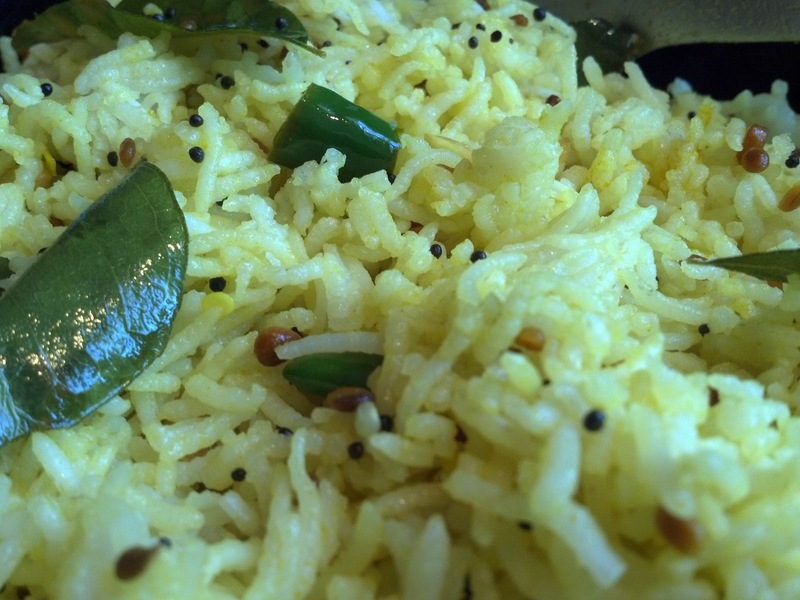 Put the curry leaves and green chillies on top of the rice mixture and set aside. 2. In a small frying pan, heat the oil until hot. Add the mustard seeds. When the mustard seeds pop, add the urad dhal, channa dhal and hing. When the dhals become slightly brown, remove from heat and pour over the rice mixture. Mix well with a spoon. 3. Serve with spicy, Indian pickles. Can be stored in the fridge for a few days, but really tastes best and has the best texture on the day it was made.